The average condo price in Manhattan has hit an astronomical $1,948,221 in the fourth quarter of 2015. In fact, Manhattan has experienced a 20-year stretch of nearly uninterrupted price increases. Will real estate prices continue to rise, or is it about time for a downward price correction? Manhattan is not unique in its meteoric rate of price increases. Potential buyers in other so-called "star" cities, such as San Francisco, Boston, or Los Angeles, must be pondering the very same question. Luckily, for Manhattan, it has kept a near complete record of real estate transactions going back to 1890. From these records, one can construct a real estate price index for the entire island. What can we learn from the history of Manhattan real estate prices? Most importantly, that real estate prices are very volatile. Tom Nicholas from Harvard and I (Anna Scherbina) documented Manhattan's experience with a run-up in real estate prices during the Roaring 20s. We found that prices peaked in 1929 and then declined by more than half during the Great Depression. I (Jason Barr) and my co-authors collected more recent data on land sales in Manhattan. Our index of Manhattan land prices from 1950 to 2014 is based on land sales transaction prices. We found that Manhattan real estate prices experienced several ups and downs during that period. The land values index, plotted in inflation-adjusted dollars, is below. The index shows inflation-adjusted values of $100 invested in a standard plot of land in January 1950 over the subsequent years. Had you bought land in Manhattan in 1950, you would have earned a nearly zero real return (nominal return with inflation subtracted out) from holding this land for the next 34 years. Since then, land prices have increased and declined again. Between 1950 and 1993, investing in land would have produced a meager real return of 0.45% per year. 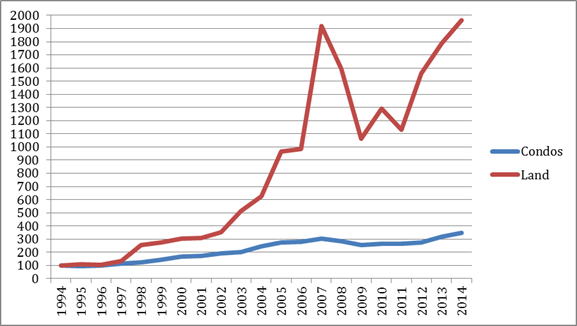 However, starting in 1993 land values really take off and reach a peak in 2007. Manhattan land prices also fell when the nation-wide real estate bubble burst in 2007, but by 2014, they had rebounded to an even higher level. Had an investor purchased a plot of land in Manhattan in 1993, the investment would have risen by a factor of 28 in inflation-adjusted dollars, and the buyer would have realized a real annual return of 16.3% per year! What was the impetus for the rise in real estate prices that started in 1993? The initial rise in prices is probably due to a combination of factors: A change in policing reduced street crime in Manhattan; baby boomers who saw their children go off to college started moving from the suburbs back to the city; Hong Kong residents poured huge sums of money into foreign real estate (read American cities) on the eve of the 1997 handover to China. The initial price increases attracted more subsequent buyers. As Manhattan's population became gentrified, crime rates fell even further and the city became an even more attractive investment to wealthy and educated newcomers from all over the world. By 2014, land prices had reached record heights. The most desirable areas of Manhattan carried a substantial premium over the average land price for the island. These high land prices made sense only if builders could construct super-luxury condominium buildings, priced for billionaire hedge fund managers and ultra-wealthy foreign buyers. In addition, many wealthy buyers were attracted by Manhattan real estate because they did not have to reveal their identities. According to The New York Times, over half of Manhattan properties priced over $5 million were sold to limited liability corporations, thus offering anonymity to the individuals actually buying the properties. Most individual real estate owners in Manhattan own a condo rather than an empty plot of land. So how do condo prices compare to land values? As land prices rise, developers must build taller and taller buildings to recoup their land investment, thereby maximizing the number of condos they can build on a given lot size. While the amount of developable land in Manhattan remains fixed, the number of condominiums keeps increasing. So not surprisingly, an investment in a typical condo did not appreciate as much as an investment in land. StreetEasy uses public condo sales records to construct a Manhattan condo price index, starting in 1994. Over the 1994-2014 period, condo investors did very well, earning a real annual return of 4.38% a year. However, investors who put this money in land, earned by comparison a staggering 14.94% real annual return. One should remember though that, unlike empty land, condos provide housing, thereby allowing the investor to save on rent. What is next for Manhattan land values? The law of supply and demand tells us that the uptrend in land prices will slow down or even reverse if either the supply of housing increases or the demand slows down. As has been the case for many U.S. cities, the supply of new housing in Manhattan is kept artificially low by various local zoning restrictions that control the height of new buildings and the population density in the area. The obvious beneficiaries of these restrictions are the current property owners. Low housing supply and high demand ensures that real estate investments continue to appreciate. (The unfortunate side effect is that rents rise with real estate prices, and renters increasingly find themselves priced out of Manhattan.) However, there is little chance that Manhattan zoning laws will be overturned any time soon. What is the future for housing demand in Manhattan? Housing demand is determined not only by objective factors (such as the economic prospects of a location and the attractiveness of that location as a place to live) but also by the less easily forecastable investor sentiment (i.e., investors' shared attitude toward a particular investment). Manhattan has much to offer for the wealthy and the highly educated: career opportunities, entertainment options, mingling with people who are at the top of the socioeconomic hierarchy. The close proximity of educated career-driven individuals increases the prospects for continuing economic growth and the attractiveness of Manhattan as a place to be. On the downside, Mayor de Blasio and the U.S. Treasury Department dealt a blow to the real estate market for the super-wealthy by implementing new rules to end real estate buyer anonymity. High-end condos have started to take longer to sell, and may indicate that supply may be beginning to exceed demand - at least in this segment of the market. The reaction of Manhattan real estate investors is most difficult to predict. Based on historical precedent, highly visible news events could trigger the worst fears and put an end to investor excitement about entire categories of investments (be it the dot-com stocks or stocks and bonds issued in various emerging markets). Any possible future event, be it environmental or political in nature, could negatively influence the current sentiment that Manhattan is a safe and exciting place to live. It would deal a blow to buyer demand and to the trajectory of land prices. Anna Scherbina is an American Enterprise Institute adjunct scholar and an associate professor of finance at the University of California, Davis. Jason Barr is an associate professor of economics at Rutgers University, Newark.